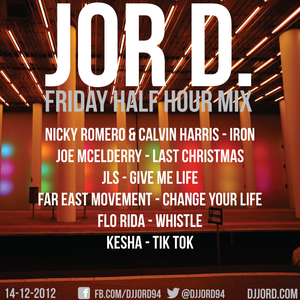 Join free & follow Jor D.
Friday Half Hour Mix 14-12-12by Jor D.
Nicky Romero & Calvin Harris, Joe McElderry, JLS, Far East Movement, Flo Rida and more. The Friday Half Hour ( FHH ) Mix from 14-12-12! Enjoy listening and have a nice weekend!